At long last, the 2012 Republican presidential nominating calendar is coming into focus. But it is not all that GOP schedule makers wanted. Rather than a February start in Iowa, New Hampshire, Nevada and South Carolina, Florida’s recent decision to hold its primary Jan. 31 has moved all the other early-voting states forward a month. There are shades of 2008, to be sure, with Iowa and New Hampshire voting in the wake of the Christmas holidays, if not before. (New Hampshire has not yet set its 2012 primary date; Iowa is looking at Jan. 3 but could be swayed by the Granite State’s decision.) And sitting at the end of January once again is Florida, waiting to act as “kingmaker” as it did in 2008 for John McCain. Maybe the Sunshine State can reprise such a role in 2012, maybe not. For all the similarities to 2008 at the beginning of next year’s primary calendar, the layout of events that follows will be significantly different. Rather than a heavily front-loaded calendar, as was the case last time, the 2012 schedule of primaries and caucuses will be spread out across the late winter and spring. As of March 5, 2008, roughly 40 states had voted. As of March 5, 2012, the number of primaries and caucuses that have been held could be as low as 10, according to the tentative calendar prepared by the website Frontloading HQ. That means that on March 5, about 40 states will have yet to vote. The new calendar is designed to produce a long-running nominating campaign that will keep Republicans and their criticism of the president in the news for months on end, just what the Democrats achieved in 2008 with the enduring battle between Barack Obama and Hillary Clinton. In a real sense, the Republican calendar has been flipped. Why the rush to the rear? Republican rules changes since 2008 have had a major impact. In concert with the Democrats, the GOP moved back the 2012 starting date for all but the four “carved out” early states from the first Tuesday in February to the first Tuesday in March. In the process, “Super Tuesday” has been bumped back a month from Feb. 5 in 2008 to March 6 in 2012, with next year’s event a scaled-down version of the “national primary” that was held last time. In 2008, Republicans in 21 states held primaries and caucuses on Feb. 5. In 2012, the number of states voting March 6 could be down to a dozen. Many states have moved to even later dates on the 2012 calendar to accommodate a new GOP rule that prohibits states voting before April 1 from awarding their delegates on a winner-take-all basis. In 2008, any state, early or late, could turn their event into an attention-grabbing, high-stakes contest by giving all their delegates to the winner. Not so this time. Statewide winner-take-all is out for the pre-April states. Proportional representation must be used to divvy up a hefty share of each state’s delegates. And for those that hold primaries before the official March 6 opening date, there will be a loss of 50% of their delegates. That not only goes for Florida, Arizona and Michigan (the latter two scheduled on Feb. 28), but also New Hampshire and South Carolina. They won seats in the penalty box by moving their delegate-selection primaries into January in response to Florida. Their actions were understandable, but were made unilaterally without authorization from the Republican National Committee. On the other hand, early-voting caucus states such as Iowa and Nevada would lose 50% of their delegates only if they selected national convention delegates before March 6. That should be no problem for Iowa, whose famed opening round features precinct caucuses accompanied by a non-binding straw vote. It is the latter that draws the attention of the candidates and the media, but has nothing to do with delegate selection. Iowa’s national convention delegates are traditionally not chosen until months later at the state and congressional district conventions. It is an open question right now how significant the early-voting states will be in 2012, beyond culling the field of candidates and providing some positioning for whoever is left. Part of the clout enjoyed by early states in the past has been due to the momentum they provided victorious candidates, enhanced by their proximity to delegate-rich Super Tuesday. In 2008, the latter event was held just one week after Florida, enabling McCain to bounce from one to the other and on to the GOP nomination in short order. But in 2012, there will be a five-week gap between Florida and Super Tuesday, with a huge stash of delegates to be chosen after that. In short, February will not be the month of decision in 2012 as it was in 2008. Instead, it will be a month of reflection for the candidates, the voters, and the media, in anticipation of the long primary season ahead. Texas, Ohio, Georgia, Virginia and Massachusetts are among the states scheduled to hold primaries March 6. Illinois will follow on March 20. Maryland and Wisconsin are booked for April 3, with the possibility of winner-take-all kicking in. On April 24, there will be a Northeast regional primary featuring New York and Pennsylvania. Two weeks later, on May 8, Indiana and North Carolina will weigh in. And on June 5, California and New Jersey will lead a contingent of states holding their primaries. For California, it will mark a return to its spot near the end of the primary calendar, where a generation ago it acted as “kingmaker” in deciding a number of presidential nominating contests. If that should happen again in 2012, many Republican rules makers will feel vindicated, the action of Florida notwithstanding. 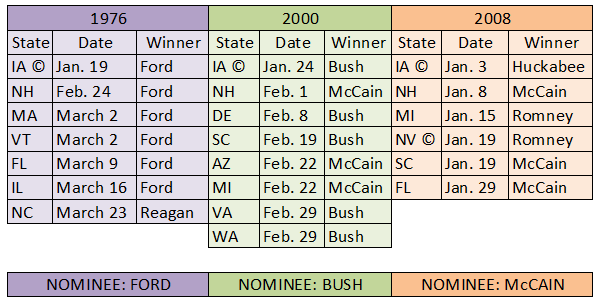 Chart 1: Opening events set the tone for GOP nominating process. Since presidential nominations began to be settled a generation ago in the primaries rather that the conventions, a strong start in the early primaries and caucuses has been critical to success. The chart below highlights the results from the early-voting states in what arguably have been the most competitive Republican nominating contests of the last four decades: Incumbent Gerald R. Ford vs. former California Gov. Ronald Reagan in 1976; Texas Gov. George W. Bush vs. Sen. John McCain of Arizona in 2000; and McCain against former Govs. Mitt Romney of Massachusetts and Mike Huckabee of Arkansas in 2008. Also to be noted: The steady creep forward over the years of the earliest events, from late winter to just after New Year’s Day. Note: The chart above includes the earliest primary states plus the most significant of the early-voting caucus states: Iowa in 1976, 2000 and 2008, plus Nevada in 2008. © indicates a caucus state; all other events are primaries. Source: Race for the Presidency: Winning the 2008 Nomination (CQ Press).